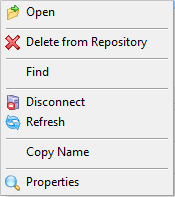 Select the required Remote System in the Repository tab and open the context menu by right clicking on the mouse. Select Disconnect to shut down the Remote System Monitor—provided the Remote System Monitor is active. If it is not, the Disconnect option is not available. This is not normally required as the Remote System Monitor is automatically shut down when the LANSA Editor is closed.